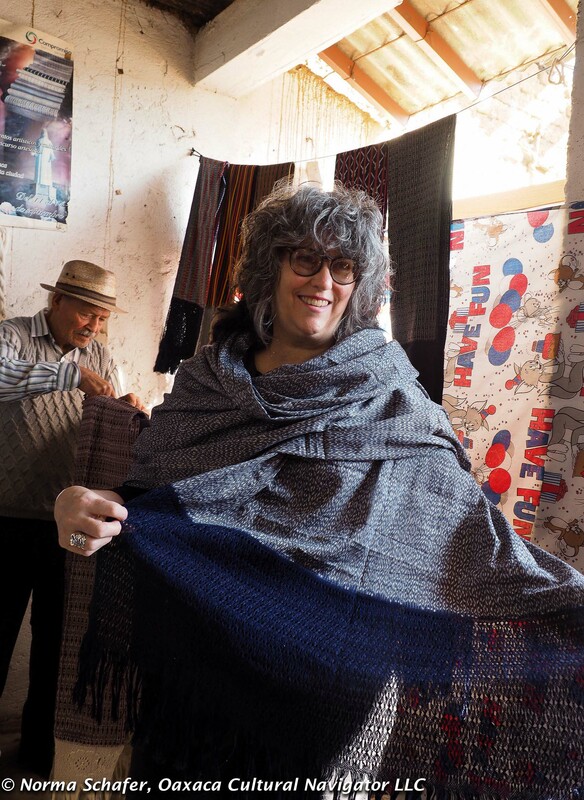 It was our last day of nine days in Tenancingo de Degollado, Estado de Mexico, studying the ikat rebozo of Mexico. 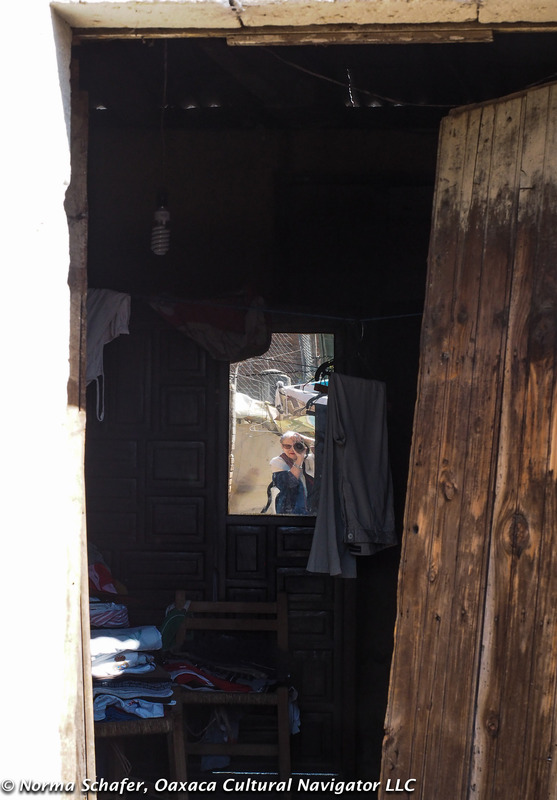 It was a free day when our ten textile study tour participants could return to visit a weaver they met earlier in the week if they wished or roam the town market. 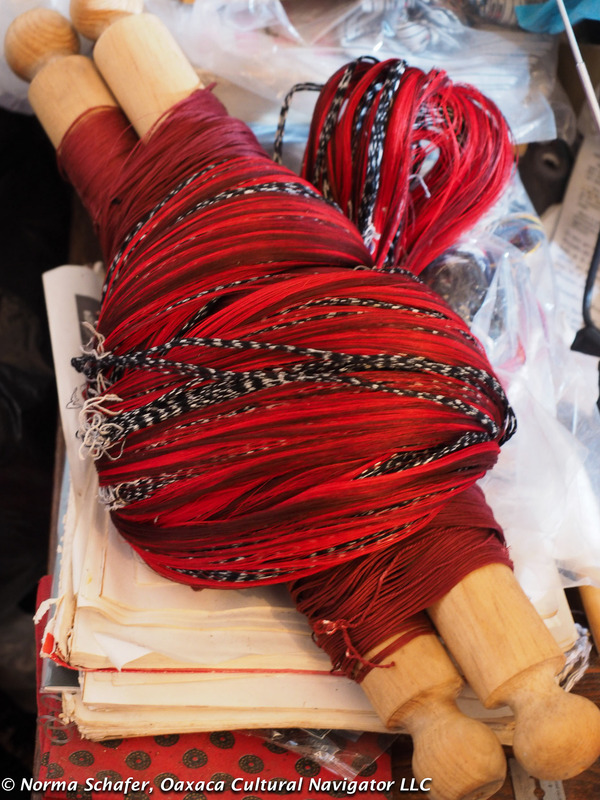 On the backstrap loom, a stunning red, black + white ikat rebozo by Evaristo Borboa, sold to one of our participants when it is finished in six months. 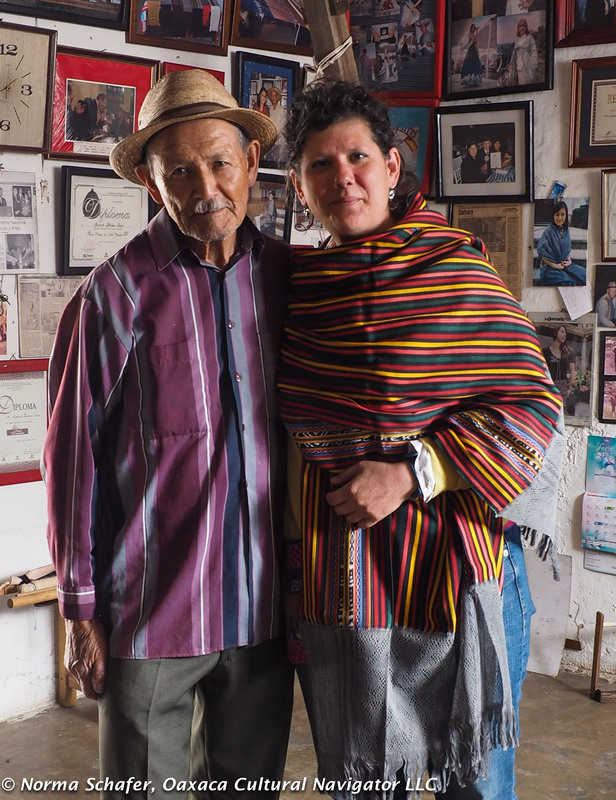 Britt and I went back to visit grand master of Mexican folk art Evaristo Borboa Casas. Britt had a particular ikat (also called jaspe) rebozo on her mind all week and wanted to see if it was still available for sale. It is a difficult task to write any words in cloth using ikat technique, but Evaristo did it with a border on each side that says, Tenancingo Mi Tierra (translated to Tenancingo My Land). 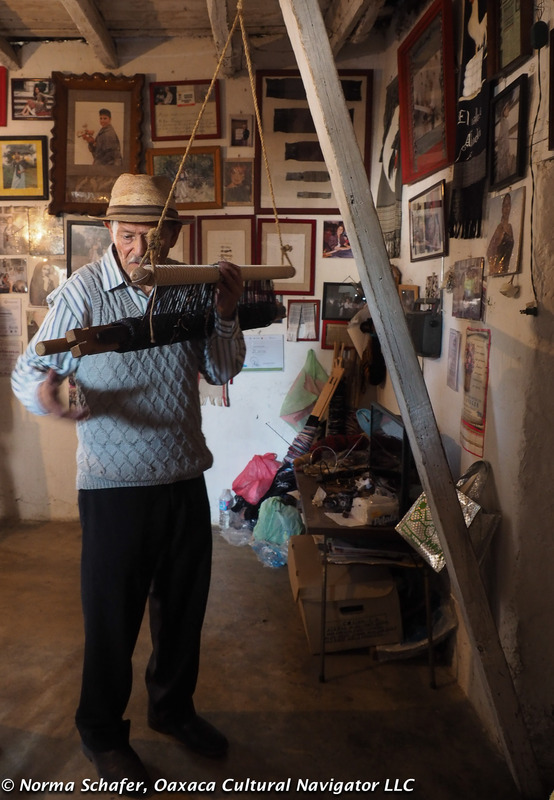 After several searches through his humble home, the 90 year-old rebozero (rebozo maker) took a hike to his sister’s house fifteen minutes away, where he keeps his stash safe. But, when he got back, the ikat rebozo woven with the words Tenancingo Mi Tierra wasn’t in that pile either. We started to panic. Then, one more hunt into a dark, secret room off the bedroom and Evaristo returned with his masterpiece! Evaristo stands upright to weave. A leather strap connects around his hips to the loom. The other end is secured to a hook on a vertical (sort of) piece of wood secured to wall and ceiling beams. He tilts back to tighten the warp threads. 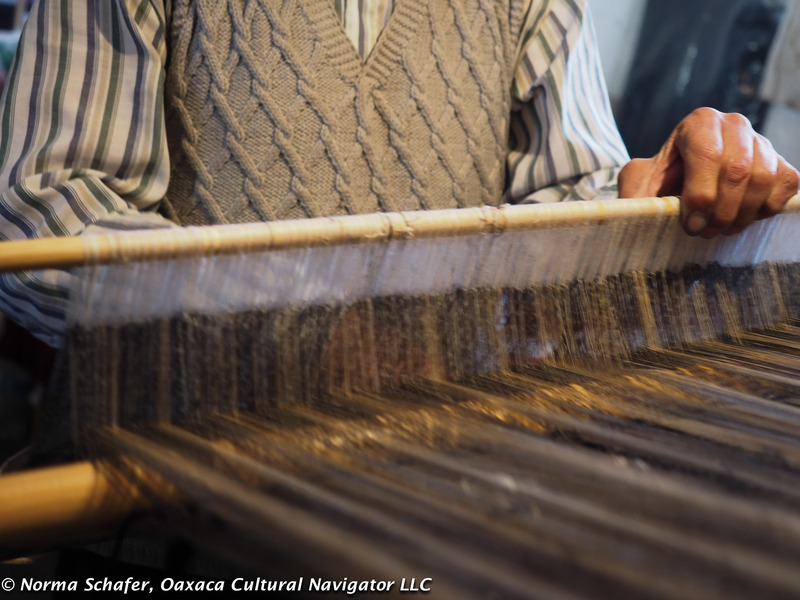 The warp, or the threads running through the cloth vertically, have been pre-dyed to form a pattern before the loom is dressed. 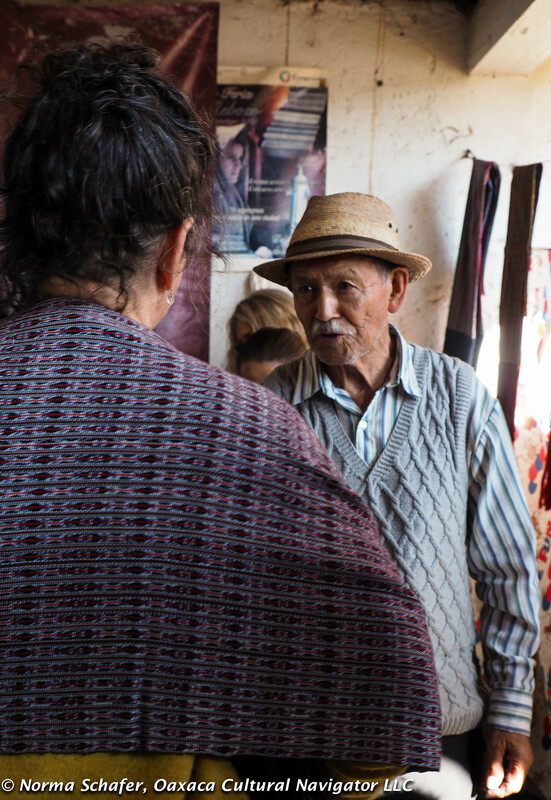 A tedious process, Evaristo only weaves 2-hours a day now instead of eleven. A master weaver like Evaristo has perfect registration and can work many colors into the cloth if he wishes. 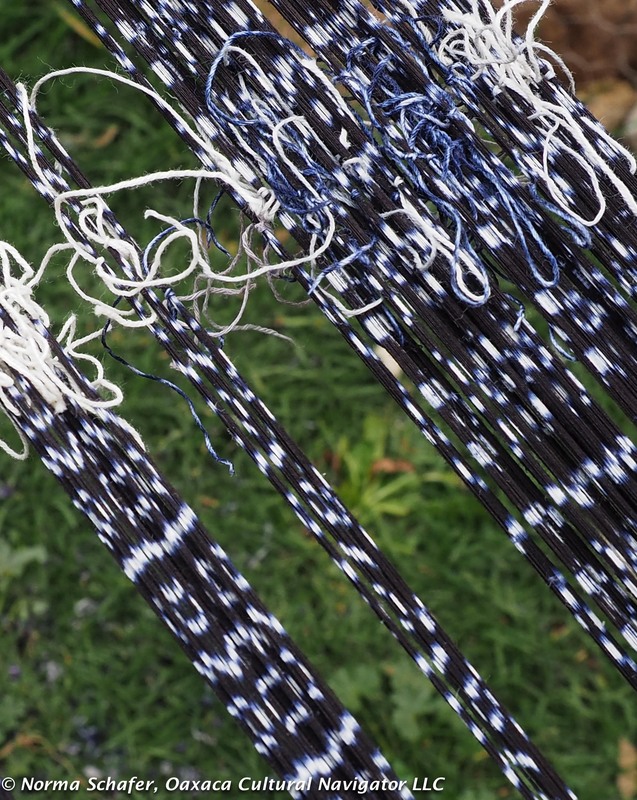 Each weaver marks the threads with an inked pattern and everyone has their own variation on the ikat design. People around town can tell who made the cloth by its particular pattern. The rebozo is an iconic emblem of Mexico. It is used as a protection from the sun, for evening warmth, to carry babies and transport food from the market. In the past, depending on color, one could tell whether a woman came from the country or a town or was working class or upper class or a woman of disrepute. This Evaristo rebozo is so fine, it can be pulled through a wedding band! 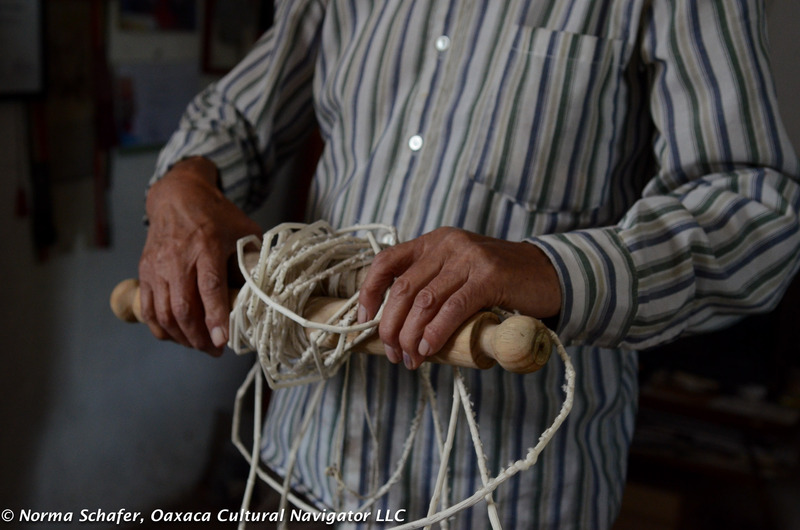 It is the men who weave here because rebozos are wider than the typical Oaxaca back strap loom used by women and the wood parts are much heavier. 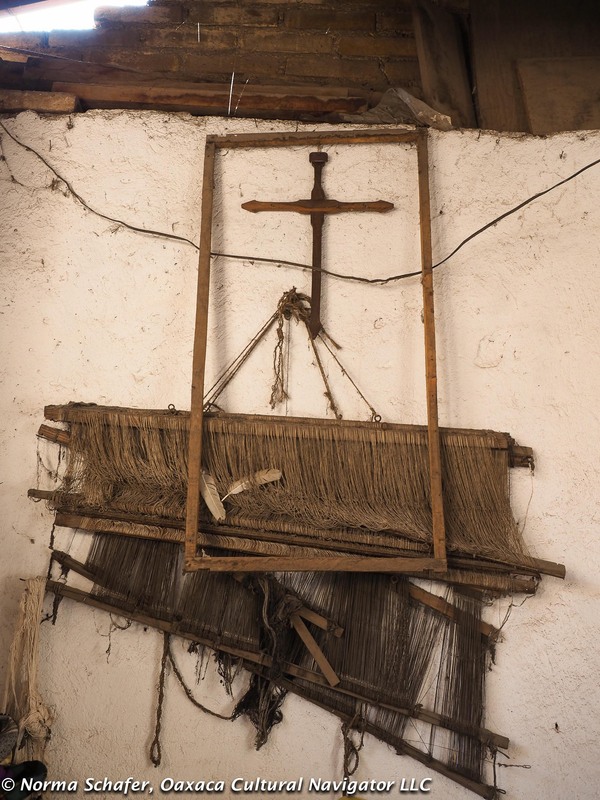 Below is an old loom used by Evaristo. We notice in Mexico nothing is ever discarded. There might be a use for it someday. During the 1910 Mexican Revolution the rebozo was worn like an X-shaped halter, criss-crossed over the front by women fighters who used it to carry bullets. 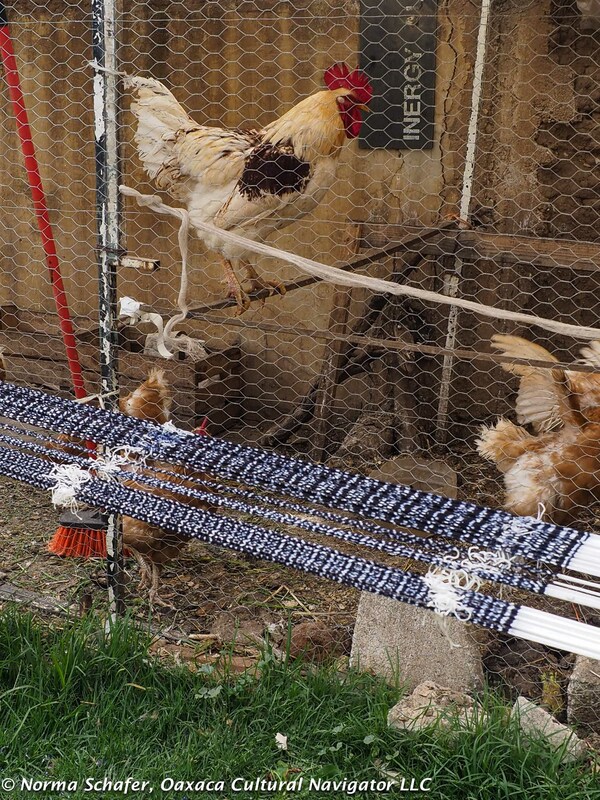 Photos above: Evaristo dyes and dries his warp threads next to the chicken coop where the rooster stands watch over his hens. 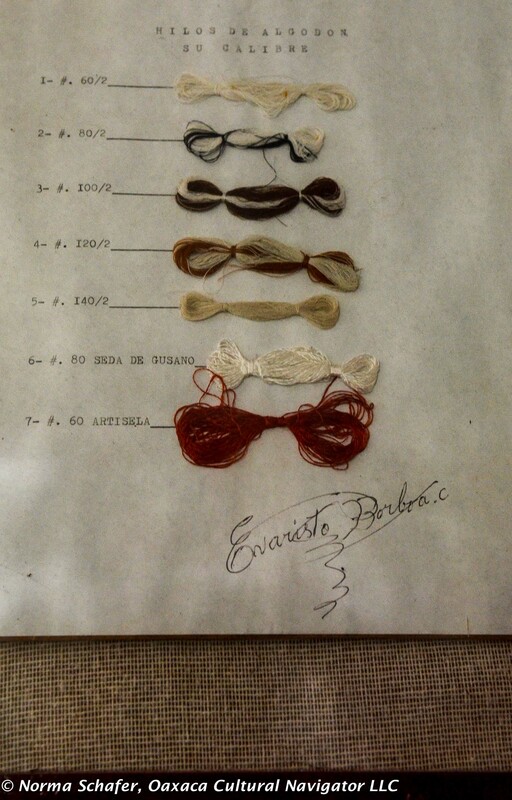 The threads are tied to resist the dye, which creates the pattern. 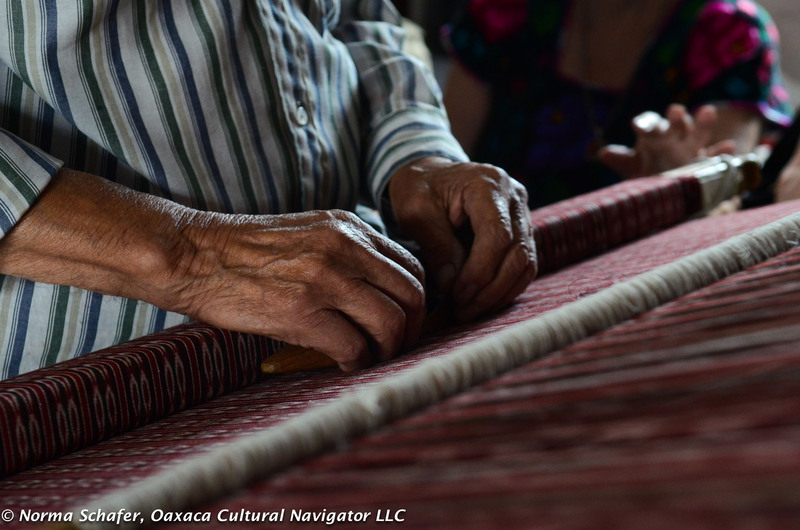 Today, Evaristo is only one of 27 rebozo weavers continue to create these amazing ikat cotton textiles in Tenancingo. In the 1960’s there were over 200 rebozeros. We are told there are about 1,500 women who hand-tie the repacejos or punta or fringes of the rebozo. They do this part-time for a few hours day, in-between cooking, laundry, tending children, gardens and animals. They sit on low chairs, lean over a narrow table, painstakingly knotting the threads at the end of the cloth. Sometimes, depending on the intricacy, like the one above, this will take seven months! A puntadora always has a long left thumbnail to help her secure the knots. Evaristo does not say who makes the puntas on his rebozos. They are straight and very tight, which means there is a lot of work and time that goes into making the fringes. 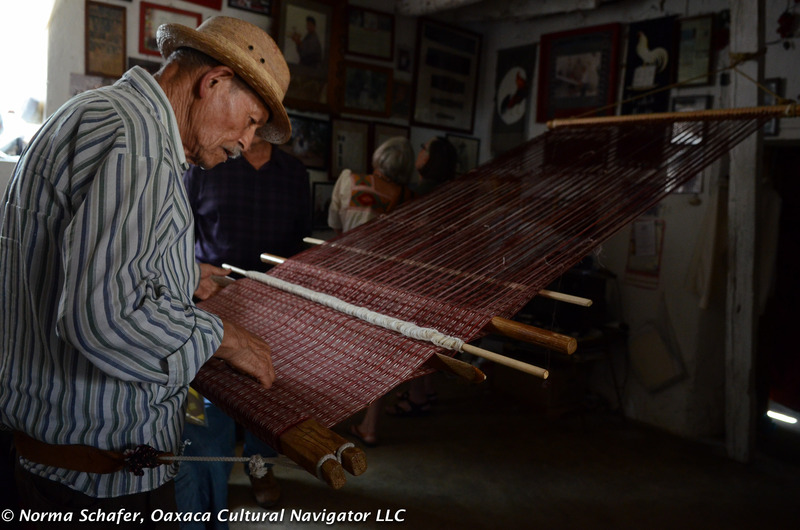 Based on designs, tightness of knots, and length of the punta, a rebozo’s cost is based on the time to weave the cloth (about two to three-months) and the time to tie the punta (at least three or four months). 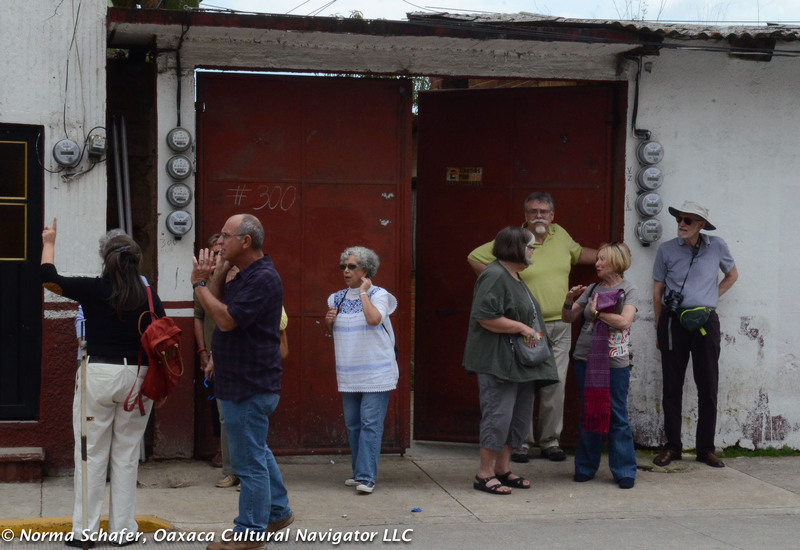 I will be organizing this rebozo study tour for either the end of September 2016 to coincide with the Tenancingo rebozo fair or in winter, mid-February 2017. There will be a few modifications in the itinerary we just completed. Please tell me if you are interested and which time of year you prefer. Get on the notification list! 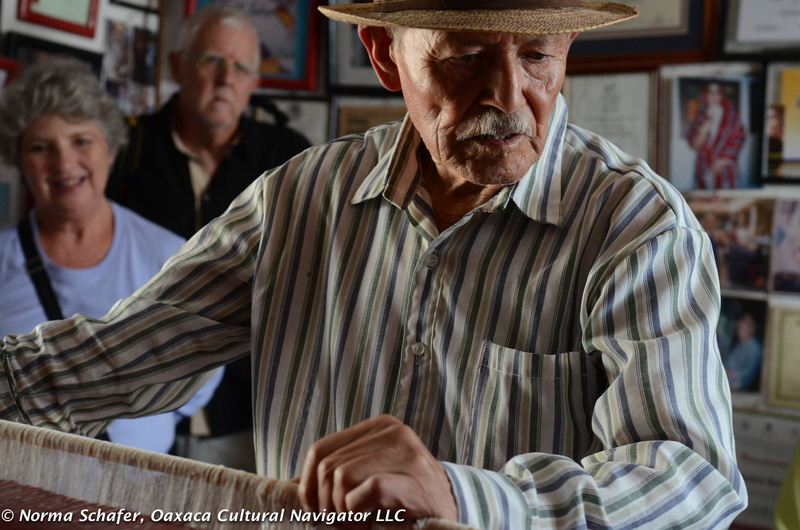 Evaristo Borboa Casas is an 89 year old weaver from Tenancingo de Degollado in the Estado de Mexico (state of Mexico). 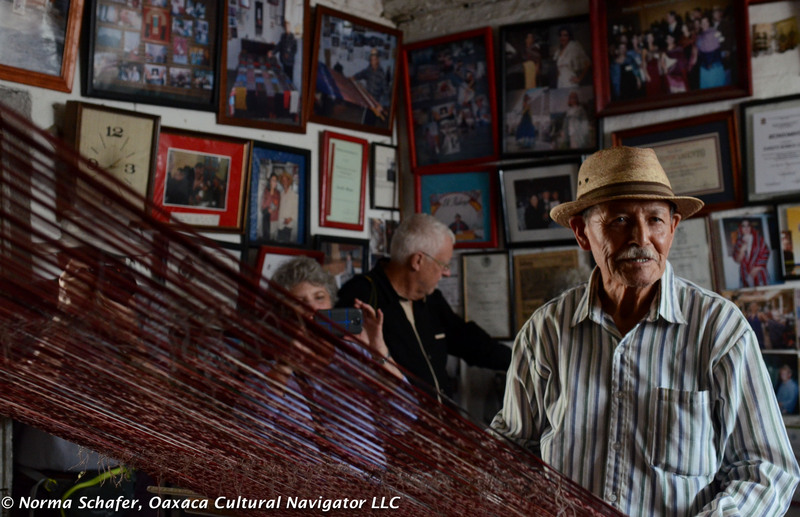 I met him on Saturday during a whirlwind visit to four rebozo makers, most of whom work on the flying shuttle loom. Except for Evaristo! He said when he was a six-year old boy learning to weave there were over 240 back-strap loom weavers in the village. Now there are only two or three. 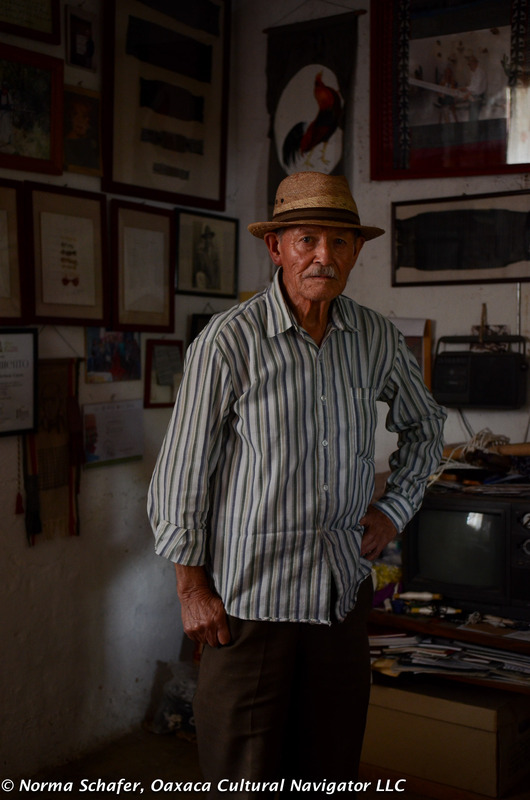 Evaristo is a Grand Master of Mexico Folk Art. His work is recognized and collected throughout the world. 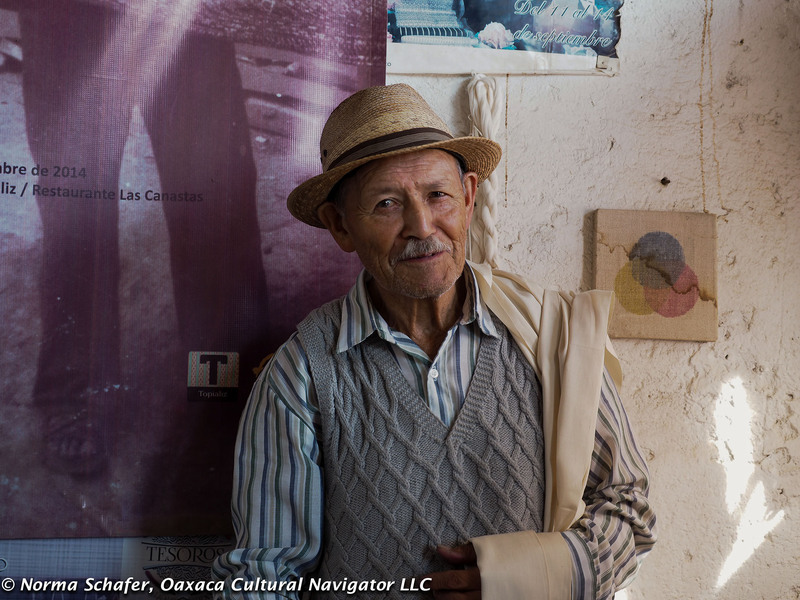 Most consider him the best and the last of the traditional jaspe weavers in Mexico. 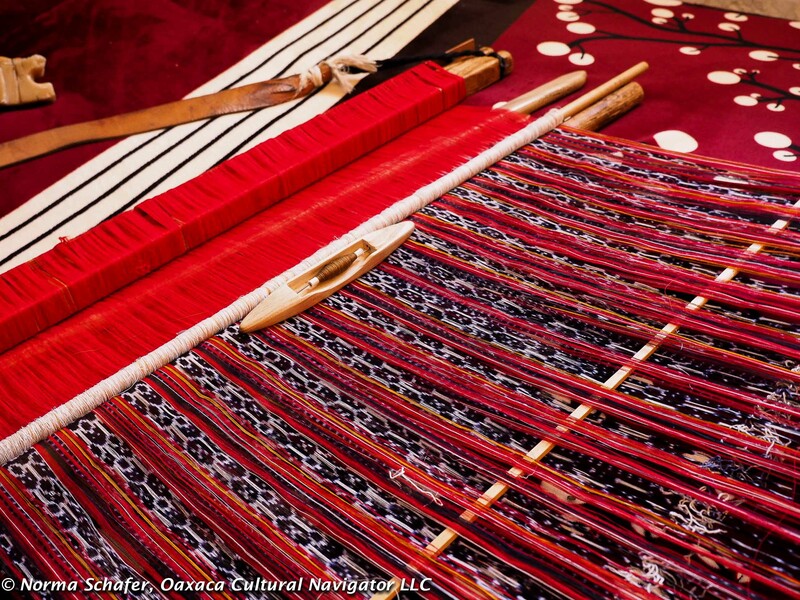 Jaspe, or ikat, is a laborious process that requires a month of yarn tying and dyeing preparation before it can be put on the loom. Putting it on the loom takes another week. Then, it can take a month or two to weave the rebozo. 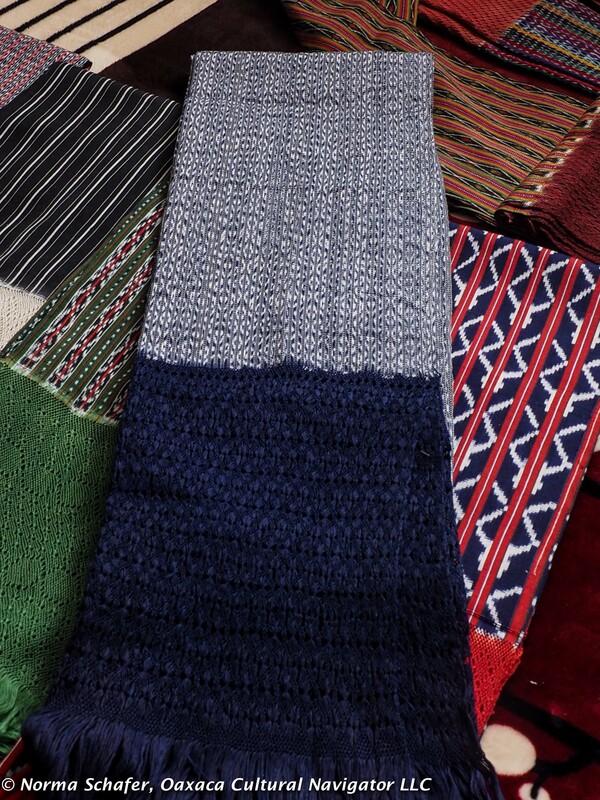 An intricate rebozo can sell for 12,000 to 20,000 pesos. When you convert that to dollars, a top-notch weaver might make $900 at today’s current exchange rate for the finest handmade shawl. 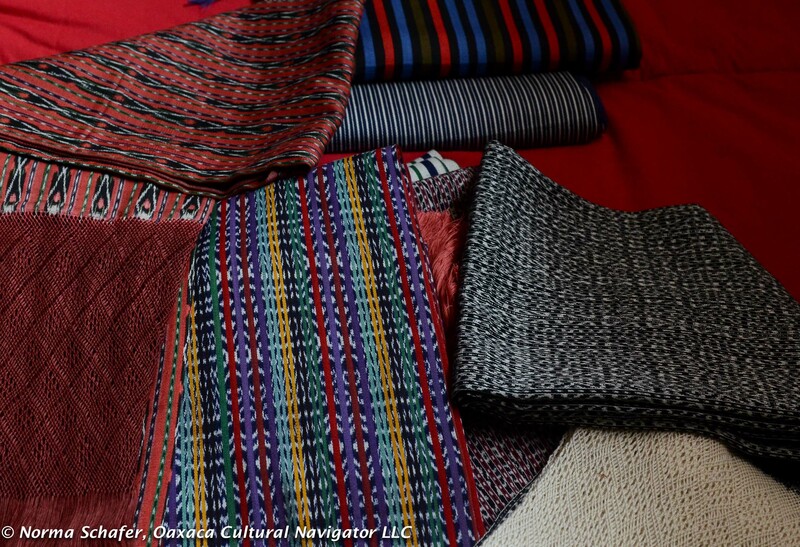 The best rebozo weavers in Tenancingo use fine cotton thread made and dyed in Puebla, Mexico. 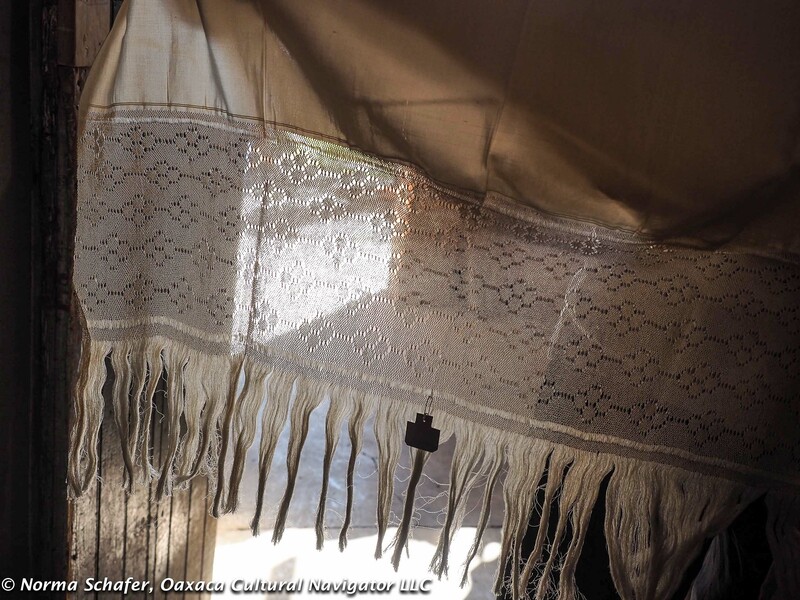 Evaristo does this for love, for culture and for commitment to the cloth as do the other weavers we met on our first day traveling with Los Amigos del Arte Popular de Mexico: Fermin Escobar, Fito Garcia Diaz and Jesus Zarate. 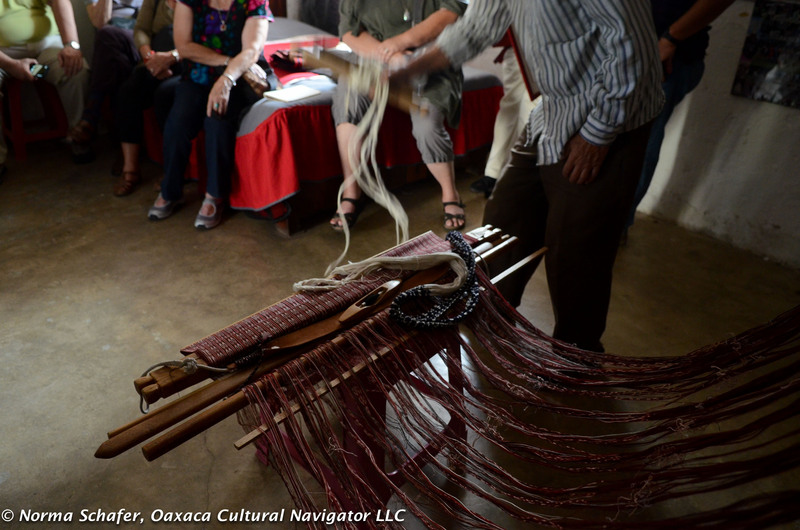 Evaristo tells us there are fourteen steps he uses to making a fine rebozo. I’m not sure I captured all that he explained, but I will do my best here. First he mounts the thread on a warping board and decides the length and width of the piece of cloth. 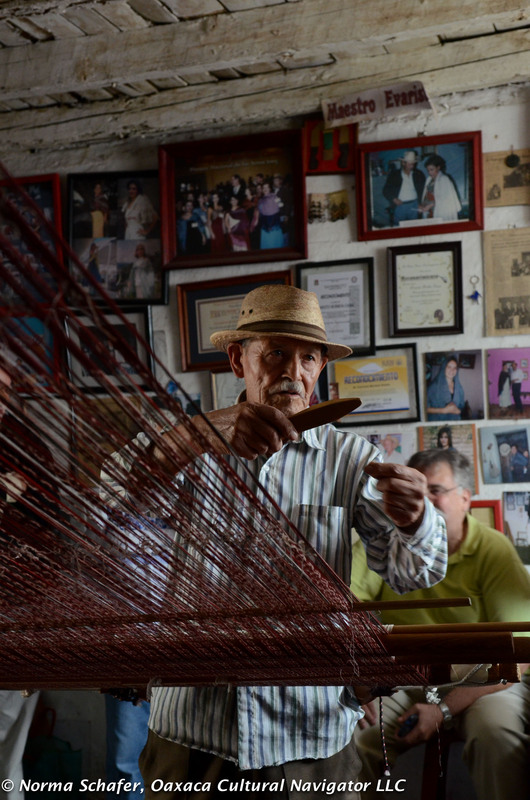 Then, he separates the threads, called pepinado, with his fingers, tying each section. Maestro Evaristo then soaks them in atole de masa (corn paste) so the threads dry to a secure hardness. He then draws the ikat (jaspe) design he wants to use on the thread. He ties and dyes the threads at the markings. 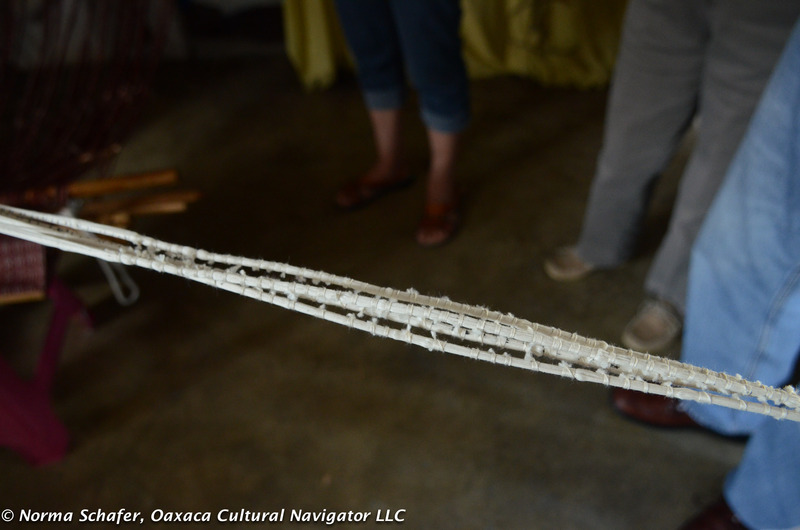 With a smooth stone, he beats the threads in water to rinse out the atole paste. As each section loosens he dunks it in water 30 times. Then, he unties the knots with a special knife and removes them from the cloth. 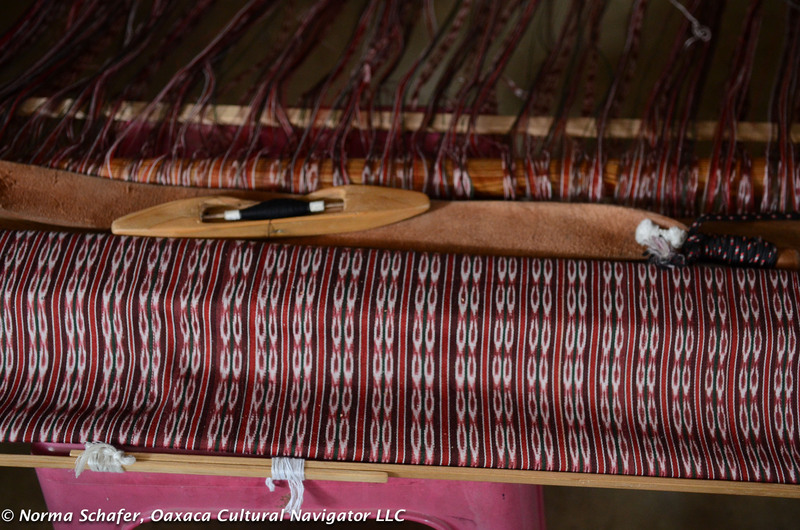 He ties knots on the back strap loom to keep the loom threads even so they don’t move. This keeps the pattern registered, even. When on the loom, he fist makes the base and then starts the field design. 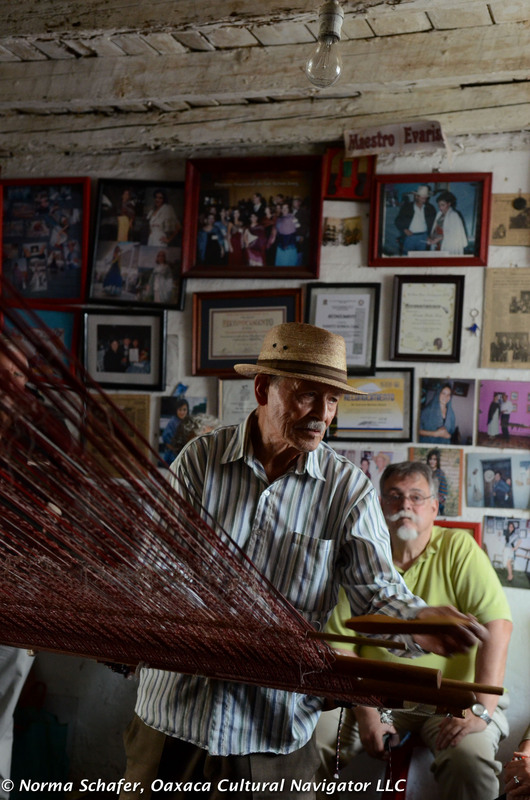 Evaristo uses 5,400 threads for the width of the rebozo. They are very fine! This is the highest number I heard during our visits to the four masters on the first day. It takes him five weeks to weave one rebozo. Then, the cloth goes to the puntadora who ties the elaborates fringes. The more costly the cloth, the longer and finer quality the punta (fringe). Making the fringe can take two to four more months of work. A punta represents about 30% of the cost of the rebozo. Los Amigos board member John Waddell organized this study trip. Members propose their travel idea to the board who approves the plan and a budget. The members organize trips as a membership benefit. 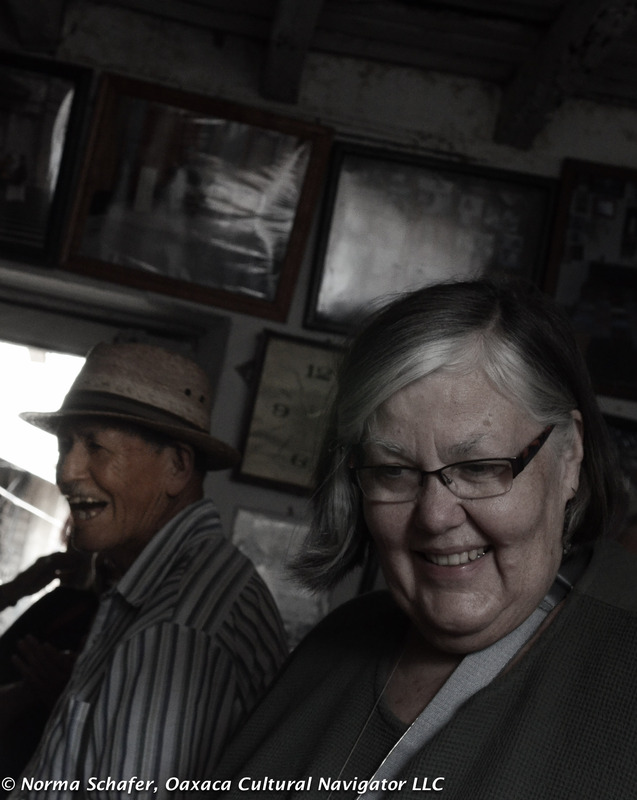 Travelers fund their own cost to get to the destination, most meals, lodging and incidentals. 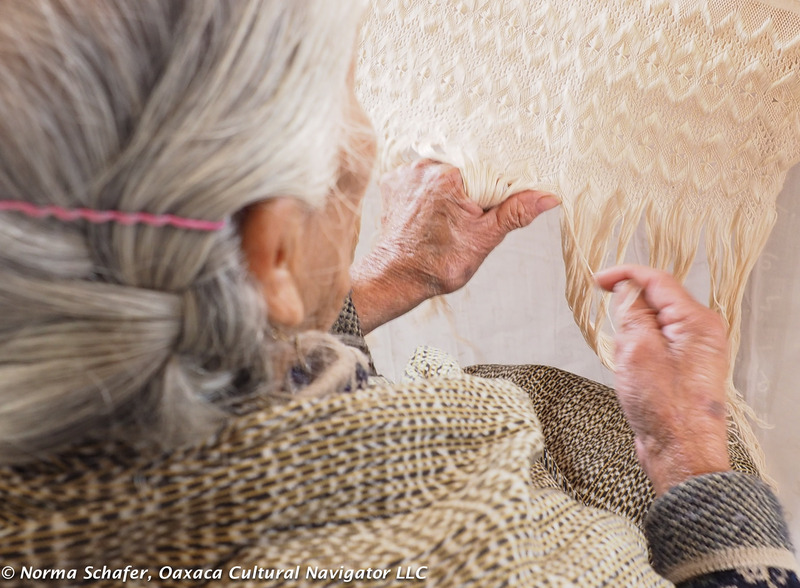 The fee to LADAP includes a donation to help support Mexico’s folk artisans and special in-country projects.